To wrap up this series, I am excited to share the most important area of my life where I strive to stay organized: my spiritual life. 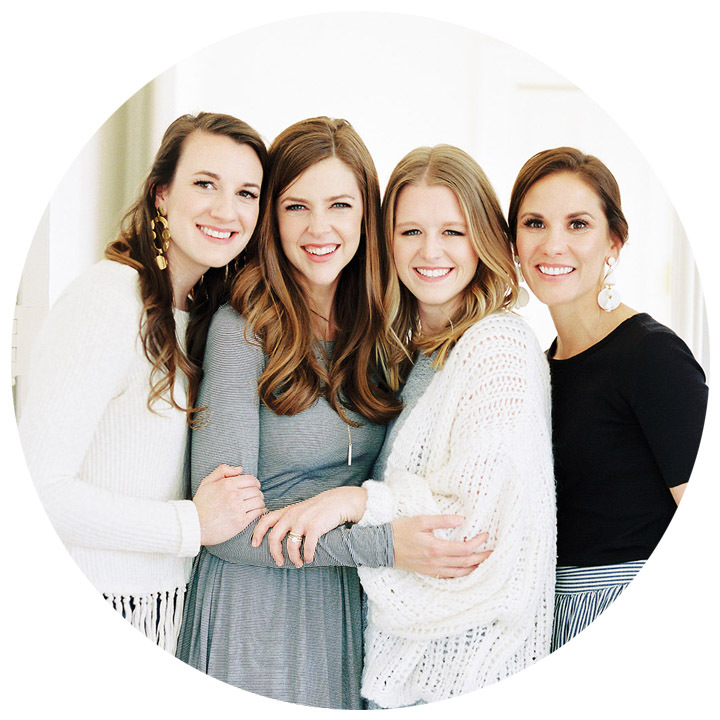 After laboring over this blogpost for a few weeks, I’ve decided to break it up into 2 parts. Stay tuned next week for the final post in my Organization series! Spiritual organization probably sounds really weird to you. Honestly, it sounds kind of weird to me, too! It wasn’t until I read Ordering Your Private World that I understood the importance of an organized spiritual life. Stay with me here. I hope you hear my heart in this, and more than that, I pray you hear the truth of God’s word in this. Our God is a God of order! I believe that one of the tactics the enemy uses against believers is to keep us disorganized and feeling scattered. The enemy wants to replace our godly priorities with distractions. He wants to keep us ineffective, strung out, tired, weak, depleted… and one way he can do this is by keeping us disorganized, especially in our spiritual lives. You know the feeling I’m talking about here – that life is happening to you, and you are not happening to life. 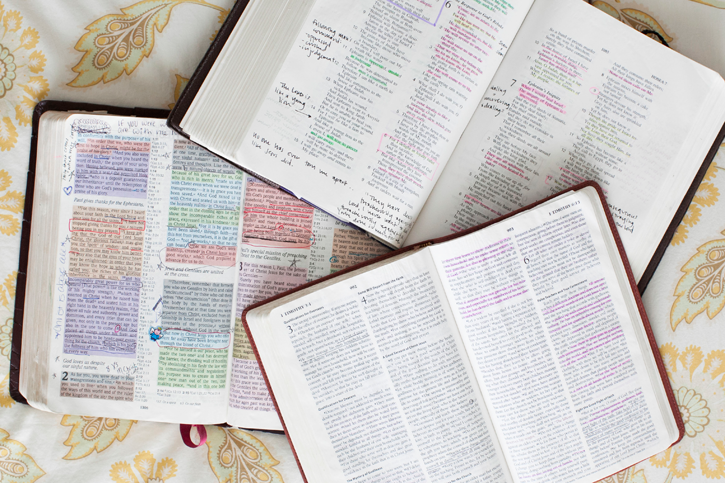 That you don’t know scripture, because you haven’t made it a priority to read it. That you feel far from God, because you haven’t made time to pray to Him. That you feel like you are putting out fires and reacting to life, rather than taking authority and living in victory. That everyone around you is a “better Christian” than you. That you are incapable, lonely, fearful, because you simply haven’t made time for the Creator to be a daily part of your life. You haven’t organized your spiritual life to make your relationship with Jesus a priority. As Thomas Kelley says, “We are trying to be several selves at once, without all our selves being organized by a single mastering Life within us.” Again he says, “Life is meant to be lived from a Center, a divine Center. Each one of us can live such a life of amazing power and peace and serenity, of integration and confidence and simplified multiplicity on one condition – that is, if we really want to.” And that is the condition with which we must finally deal. Do we really want order without or private worlds? Again, do we want it? With those words echoing in our thoughts, I humbly share with you the ways that I strive to stay organized in my spiritual life. My prayer is that this would help you in some way to strengthen your relationship with the Lord. When I had just decided to follow Jesus, I wasn’t sure how to read scripture. For starters, I was only 11 years old. But I was so hungry for the word of God! I have a distinct memory of the summer I became a Christian. I was laying on the bed in my lake house, I had my rainbow colored Bible, and I randomly opened my Bible to the Psalms. I was reading through a chapter of Psalms: underlining, circling, and putting little angel stickers near my favorite verses. But I didn’t know what I was doing, or if I was doing it right. All I knew was that I wanted to learn the Bible. – Choose 1 book of the Bible and read through it slowly, underlining and writing notes in the margin or in your journal as you go. – Focus on a chapter for a month, re-reading it over and over, with the goal of memorizing it. 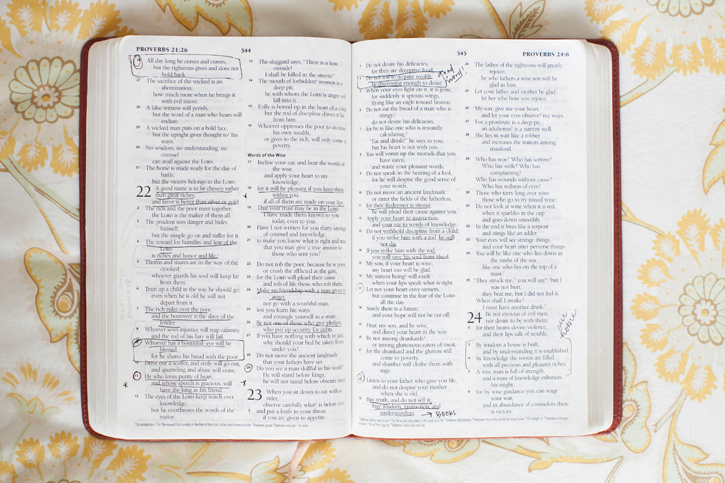 – Read through the entire Bible at your own pace, checking off each book in your table of contents once you complete it. – Read through the Bible in a Year. (There are lots of plans on Youversion! I completed the Genesis – Revelation plan a few years ago. This year, Will and I are reading the Chronological plan.) You don’t have to start January 1. You can start today. – Base your daily/weekly Scriptural readings on the sermon you heard on Sunday, or a Bible study you are going through. – Pick any book of the Bible and read 1 chapter a day until you’re finished. Then pick another book and repeat. I find that it is more beneficial in my spiritual life and basic understanding to choose an organized way of reading scripture and seeing it to completion. This allows for you to read the words in context, with a plan, rather than randomly opening your Bible. Also, it’s worth mentioning that I firmly believe in writing in my Bible! I’ll even write dates or names near scriptures that relate to events or people in my life that I’m praying for. I underline, circle, highlight, and write. My sister has a great approach to marking in your Bible as well. A personal guideline: I don’t like to buy a new Bible unless I’ve read through my current one at least 2-3 times. It has to be very, very used before I buy a new one. Pictured below: the 3 Bibles I have read and used since becoming a Christian when I was 11. I’m so thankful for this comment from my last blogpost, and I’m excited to answer it: I would love to hear specifically what you write in your prayer journal. Do you write to God, like in a prayer format? Do you write down thoughts about what you’re praying for? 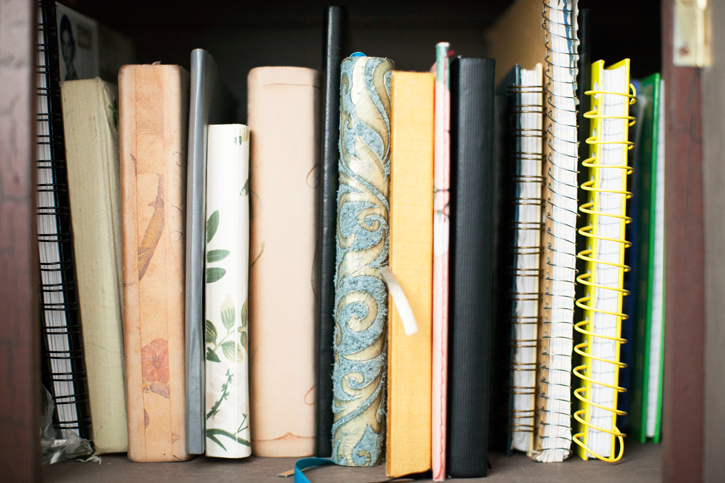 My journals are some of my post precious possessions in my home. I have a cabinet filled with completed journals from the time I was 11. I have prayers, sermon notes, thoughts, and scripture written down from so many seasons of my life: when I just started following Jesus, when I gave up dating for a year in high school to strengthen my relationship with the Lord, when I graduated, when boys broke my heart, when my parents got divorced, when I fell in love with Will, when I went to college and was very homesick, when I became a wife, when we lived in Boone, when we moved to Raleigh. I wouldn’t trade these journals for anything. Over the years, I have learned and planned to use my journals effectively. I am happy to share my journaling methods with you today! – When I start a new journal, I write the month and year inside the front cover (ex: March 2014). When I finish a journal, I put the month and year on the back inside cover. This allows me to glance at a journal and know the season of life in which I was writing. – I always write my name and phone number on the front page, so it will (hopefully) be returned to me if I misplace it. – If I attend a conference or workshop that offers its own small notebook or journal for note-taking, I choose not to use it. Instead, I bring my own journal with me and keep all notes from every sermon / conference / workshop in the same place. I love keeping a detailed record of those little things, because looking back I especially love to remember the small feelings of the day. I love to recount when it was snowing, or when I was journaling at the beach, or if I felt a little sad for some reason. It provides context for the content in the pages of my journal! I learned this little tip from Michael Hyatt, who has a different yet insightful approach to journaling. I would say most of my days I write 1 Bible verse, a prayer, and a few thoughts on 1 page. Some days I don’t write anything. Sundays, I usually only take sermon notes and that is my “journaling” for the day. In the beginning of each month, I’ll write down my goals or “to do’s” I want to accomplish. I also have a gratitude journal that Callie made for me, and I love it. 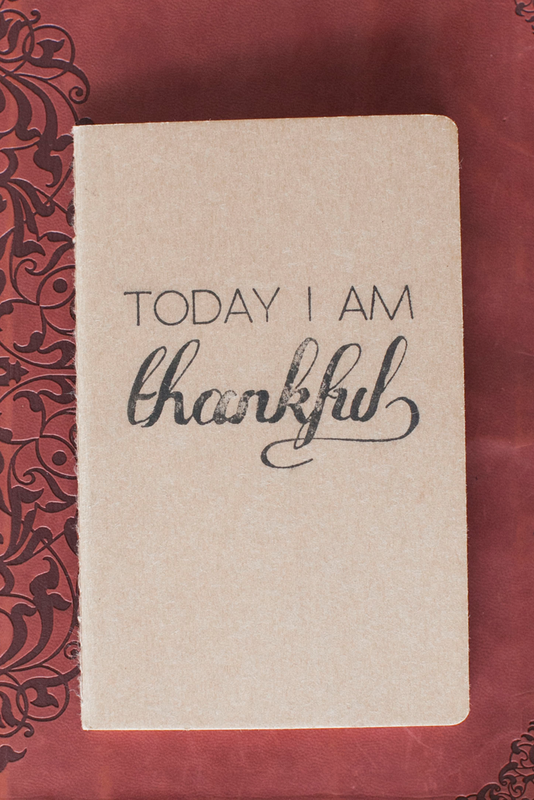 I write down “3 Thankfuls” each morning in detail. This allows me to start my day from a place of abundance, rather than feeling like I don’t have enough time, energy, resources, etc. The truth is, we all have so much living here in America. We just need to stop and express our gratitude for what we do have. This one is simple, but we seem to make is so complicated, don’t we? Prayer is nothing more than simply talking to God. I always say a prayer before opening my Bible to read scriptures, to ask the Lord to open my heart to what He has to say. I pray throughout my day, as it comes to mind. One sentence prayers are just as important as lengthy prayers. 1 Thessalonians 5:17 says that we should pray without ceasing, or pray continually. I have a lot of room for growth in this area! Even if you just take 30 seconds to pray each day, it is better than no prayer at all. Remember that God is our Father! What father doesn’t want to hear from his children? Church is part of our weekly routine. Yes, my husband is on staff at our church, but even when he wasn’t – church was still part of our weekly routine. Making this a priority in our weekly schedules is a simple way to stay organized and prioritized in our spiritual walks! There are so many benefits to going to church regularly: listening to teaching on Scripture from a gifted teacher, making friends and relationships with people who share your faith, starting your week off right, worshiping and singing with others uplifts your spirit, sharing your burdens and your joys with those around you allows you not to walk through life alone. Going to the same church every week is an incredibly important part in the life of a believer. We need one another! Can I get an amen? Thank you so much for this beautiful post! I love your humility and honesty, and everything you said about keeping your spiritual life organized was really inspiring to me. Keep these posts coming!!! I live in Bolivia and this is an awesome way to grow closer!v Thanks so Much! My name is sharney and I’m from South Africa, you have helped me and given me an understanding of how journaling is important and part of our spiritual growth. I’m in my early twenties and I’m at a stage where I want to be deeply rooted into the Lord Jesus Christ and your advice has helped me. Ready to start my Bible journal journey. So encouraged by this! I love this so much!! Thanks for sharing!!! I’ve loved your organization posts! Your ideas are so practical and duplicatable! I know you invested A LOT of time writing these…Thank You! I’m a organized person, but I’ve been struggling with “where to write everything”. I’m giving myself permission to write all my thoughts in one spot…thanks! Love this! I have recently started doing Kristin Schmuker’s Joy In Christ devotional and it is really getting me back into journaling. I have a huge collection of journals and poetry books but I’ve been in a real funk the past couple of months. The accountability of her #lampandlight movement is really helping me stay focused…not perfect, but focused. I just wanted to say thank you for taking the time to write this post. I have a great appreciation for organization but at the same time have struggled to find a way to organize my devotional time. Having a routine but at the same time keeping it carefree. This definitely has balance which I have been looking for! It’s like when you have that word on the tip of your tongue but can’t quite remember what it is. I have seen how God has worked through your business and it is always refreshing to hear about someone else’s experience even when you are strangers. What a beautiful and encouraging message! Thank you so much!! I heard about you blog through my cousin and her husband- Emily and John. You are a very talented photographer. It’s awesome that you are using your gifts for Him! God bless you!! This is beautiful, Nancy! Sometimes, I feel silly keeping a journal but you made it seem like a precious gift. I can’t wait for part 2. I’m truly encouraged by you. Thank you for your heart. I cannot tell you how encouraging this is! I’ve hit a low point in my relationship with the Lord and have felt really distant from Him. I’m so excited to start prayer journaling and being eager to read my Bible again! Wow, what an awesome post! This is SO incredibly helpful — thank you!! Thank you, Nancy! This post couldn’t have come at a better point in my life and I am so thankful to you for sharing. I’ve been wanting to dive deeper into the Lord’s word to help direct my steps and express my feelings and thoughts. Excited to start a journal myself and study scripture daily. Thank you for taking the time to write this post – I know it must have been a doozy! I am so thankful for everything you shared (and that you answered my question!). I have a feeling I will be going back and re-reading this post many times to glean everything I can from it! Love you! I’m a school teacher and am ready for summer break. 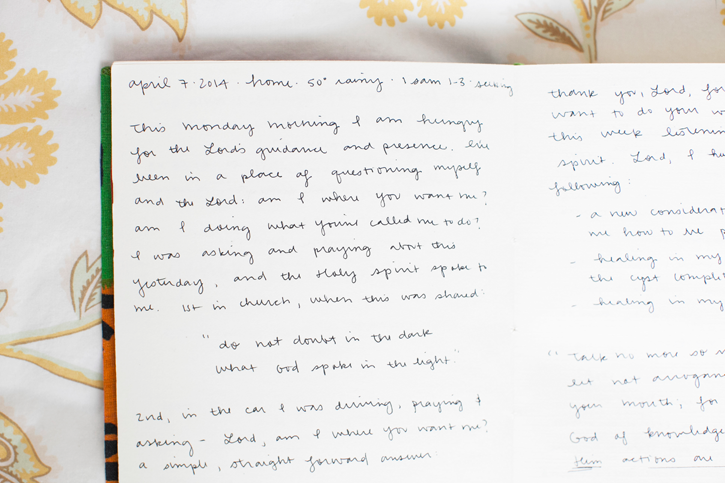 This post really helped me refocus on journaling in my daily quiet times! Looking forward to your next post! ps…your photography is awesome! I’m a photographer wanna be! Thank you so much, Nancy! This post ministered to me so deeply. I am signed up for your Influence talk tonight. I struggle so with distraction, busyness, frantic to do lists and I still don’t have balance. I really know that God is working with me in this area and He is definitely using you! Thank you for your openness and your encouraging words!